While Halloween is a fun and exciting holiday for human adults and kids alike, it can be a rather stressful night for your kitty. 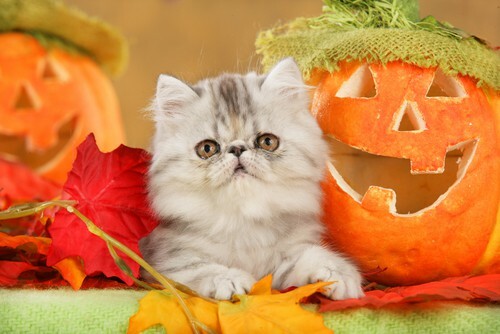 The constant stream of witches, vampires and monsters knocking on your door, shouting, “trick or treat” is stressful enough, so you should take some extra precautions on October 31st to keep your furbaby safe and stress-free. We believe all cats should be kept indoors, but especially on Halloween night. And, definitely if your cat is black. Though the statistics on black cat torture and abuse during Halloween are lacking, enough young and impressionable minds have heard the stories – and might decide to make these rumors a reality. 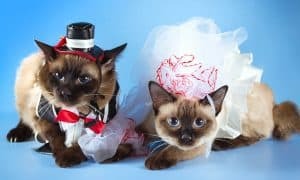 Not only that, even if your cat (of any color) is used to being outside, there will be a lot more people and traffic out on Halloween night and your kitty may find himself scared and disoriented. Keep your cat away from your front door. Cats are notoriously curious and may want to see what all the excitement outside is all about. Confine him to a room or area of the house where he can’t slip out between your legs while you’re handing out candy bars. 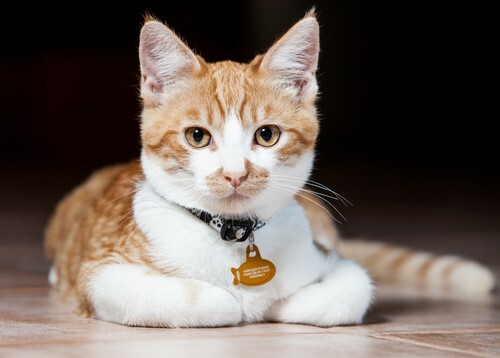 It’s a good idea to have your cat wear a collar with identification, even though you’re not going to let him outside…just in case he should get spooked and decide to make a run for it. 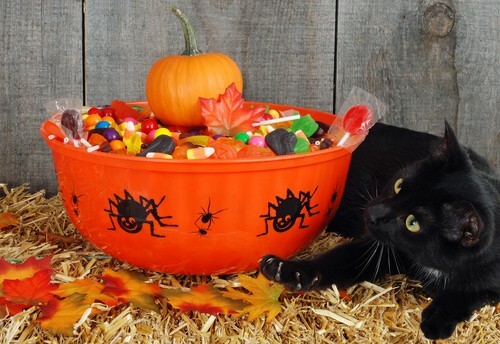 Keep your candy dish out of your cat’s reach. 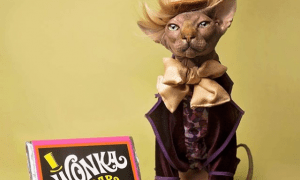 Chocolate is toxic to cats, even in very small amounts. Sugary candy can cause stomach upset. Candy wrappers make a fun toy that can quickly become a dangerous intestinal blockage if swallowed. Make sure kitty stays out of your Halloween decorations, too. Ribbons, tinsel, fake spiderwebs…are all enticing to a cat and all very dangerous if ingested. 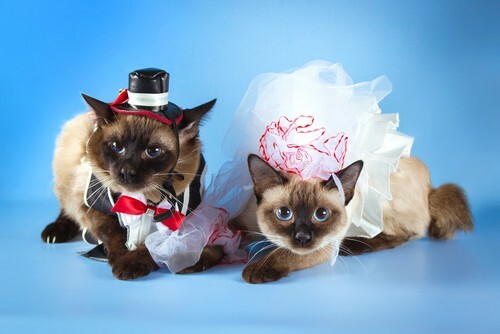 Unless your cat is accustomed to wearing clothes, don’t force him to wear a costume. It’ll just stress him out. If he does wear a costume, only have him wear it while supervised. You’d be surprised how quickly a cat can get tangled up in a bumble-bee outfit! If your feline friend is especially anxious or prone to getting stressed, consider using a calming product like feliway, thundershirt, or a medication prescribed by your veterinarian. Show your kitty some extra love and attention leading up to and following the stressful holiday, so he’ll have time to relax before the next big holiday comes around! 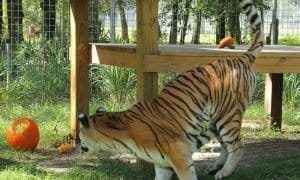 VIDEO: Halloween Came Early for the Animals at Big Cat Rescue! 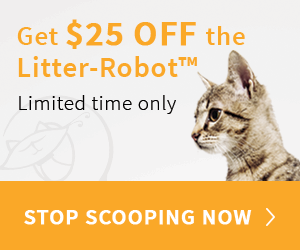 You can also use Pet Rescue remedy to help keep the kitty calm.